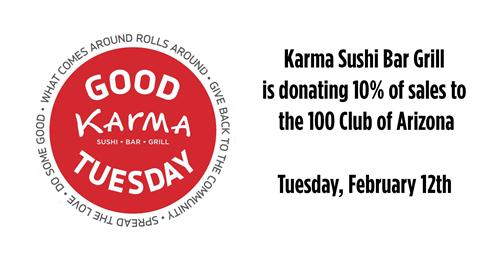 On Tuesday, February 12th, 2019 Good Karma Tuesday will benefit the 100 Club of Arizona. Ten percent of all sales will be donated and will contribute to the primary mission of the 100 Club of Arizona, which is to provide immediate financial assistance to the surviving families of public safety officers and firefighters killed or seriously injured in the line of duty. The 100 Club of Arizona started out in 1968 as a small group of people that got together and contributed money to families when there was a line of duty death of a police officer in the Phoenix area. Since that time, the 100 Club of Arizona has expanded to include ALL public safety officers and firefighters in the State of Arizona. We serve sushi, ramen, grilled items, and cocktails in a hip, casual setting, and are located at 6 East Route 66 in downtown Flagstaff. Karma has been voted Best Sushi in Flagstaff for the last 9 years! Karma Sushi is open from 11 a.m. – 10 p.m. on Good Karma Tuesday. For more information about the restaurant, visit karmaflagstaff.com or call 928-774-6100.